We live in a historic area of Atlanta near the CDC. For a city, Atlanta is quite green and wooded. Our home is new, but on property that was a former dairy farm (1800's) and the site of Sherman's camp during the Civil War. I've unearthed artifacts in my flower beds. A train clacks nearby as it moves on the spur-line a few times a week. Wild turkeys nested on our deck rail for years until the coyotes took up residence in the woods along those tracks. They yodel at day break when the owls are finally quiet. A family of hawks cry out in the afternoons, their shadows slipping across the back yard as they patrol the bird feeders. Crows and Jays fuss and chase them from poplar to poplar. At dusk during the summer, cicadas begin their pulsing, rattling chorus and drown out the cricket song. At the back fence is an outhouse that belongs to the old homeplace beside the tracks left from the time this was dairy farm and not intown neighborhood. The only thing missing....some peeps! 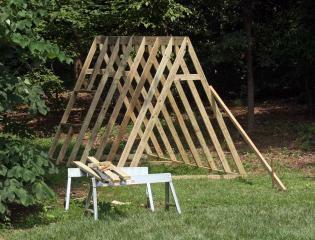 We then nailed up the two sets of end rafters first at base and top of ridge, then braced them with scrap. 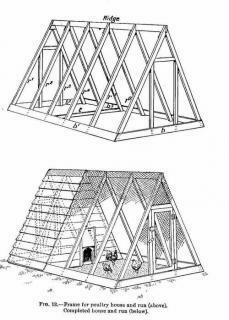 We added the remaining rafters on center at every 24 inches so that each "bay" was 2 ft wide. View of the framed structure from run side that faces our house. We framed in the doors (angles are a little tricky, but it works to hold board to be sawed against the cross board, trace angle, then saw.) 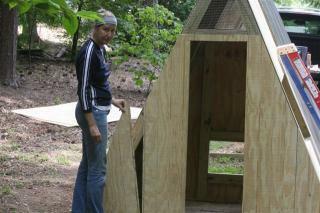 There is a door on each end: a wooden one for the house and a screened one for the runDays 3-5: . 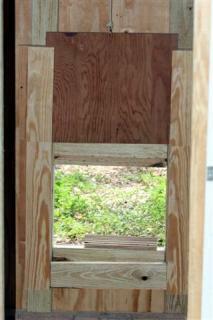 We also framed the pop-hole area and added studs to attach the siding to. We trenched around the base 12" deep and wide, then attached the hardware cloth.We used most of a 100ft roll of 48" wide wire with 1/2" weave. (Perfect dimensions for our 2ft bays.) To install, we rolled out enough wire to cover both sides of the run plus another 48" to toe-out and bury. 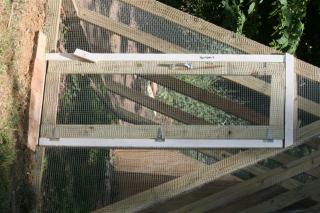 (Each panel covers two bays.) We then folded the panel end-to-end and creased it midway, hung it over the ridge and used a 2x4 block to pound it flat against the beam. 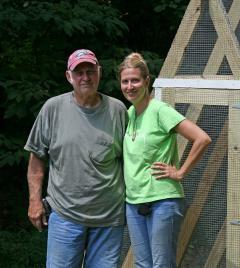 We attached it to the ridge and along each rafter with heavy duty poultry nails. Then we began the siding. 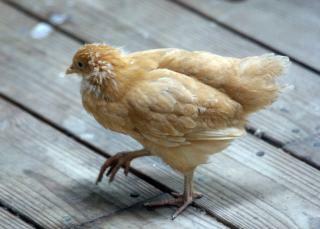 In the meantime, someone offered me several 4 week old pullets in the breeds I wanted. 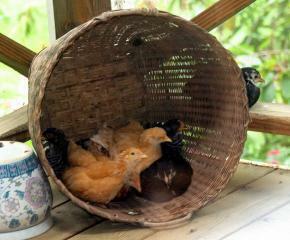 Of course I picked them up and put them on the back screened porch...which quickly became a big messy birdcage. They are awfully cute to watch while drinking coffee! But I'm motivated to work faster. 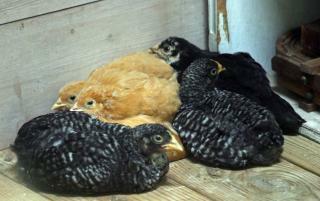 Ava, Rita, Lana, Hedy, Bettie, Sally(RIP-hawk), & Mae. ays 6-8 We construct and install the doors. 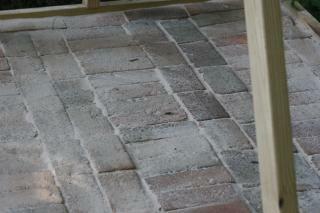 We gave them a 2" overlap on the 18' opening, then trimmed around them with 1x2 so that there are no gaps. I am paranoid about predation, so put 3 latches on each door. I found that two wooden wine crates sitting side by side inside the box work perfectly as separate nests, and can be removed for easy cleaning. Plus they look very nice. There is overlap at the bottom to keep predators from prying or pushing it open.Just make sure you make the track at least 1.5x taller than your door to keep it stable and in the groove when you open it. 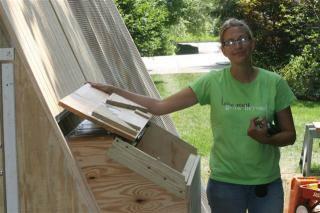 We finished the siding gaps at the ridge by installing a plastic ridge vent to cover it. Dear son and his buddy painted the outside using exterior left from our house. 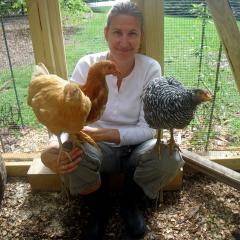 I installed roosts in the run and the house, hung the water and food outside, put litter inside and the chickens left the back porch for good! 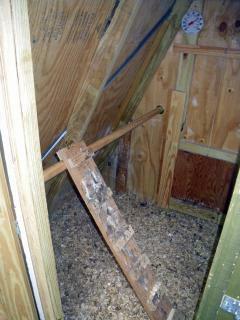 We used a 3" wooden curtain rod set in closet brackets for the roost across from the nest box. 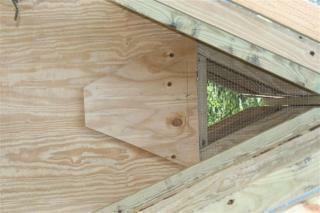 They are 12" from the wall, and about 12" higher than the nestboxes to keep the girls from roosting in them. A solar outbuilding light purchased from Sam's Club is attached to the ceiling with the solar panel attached to the roof beam outside facing south. 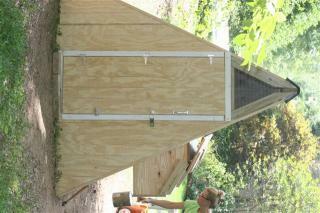 We waited a week or so, then tackled the shed roof addition. It consisted of adding a 1x2 ledger board below the ridge vent on one side. 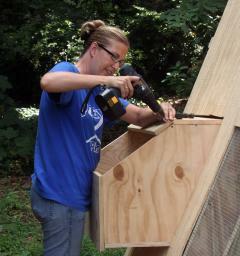 We made it 8 ft long to cover the nest box and part of the outside run on the side with the food and water. We attached metal rafter hangers to the ledger board every 20" and stood two landscape timbers on end in prefab concrete bases about 7 feet away from the ledger board. We attached a 3-sided frame (built in the driveway) to the outside hangers and two posts, then filled in the remaining rafters. 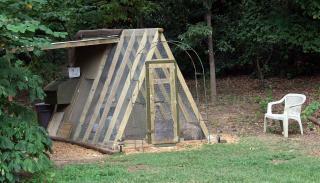 We covered it with corrugated aluminum panels attached with rubber gasket roofing screws. 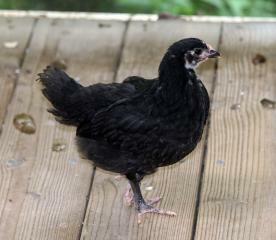 After some heavy rain, I can say it keeps the nest box dry and part of the run as well. Thanks Dad! 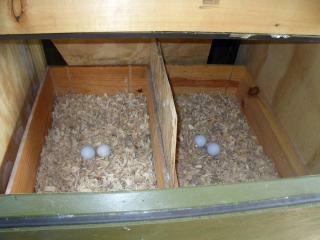 Now for some appreciation from the girls... a few fresh eggs? 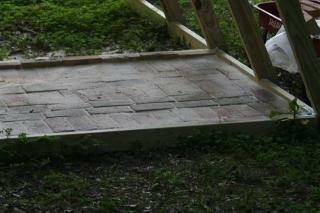 Note: I didn't have a lot of recyclable materials other than the shed timbers, brick, paint, and a little bit of wood. 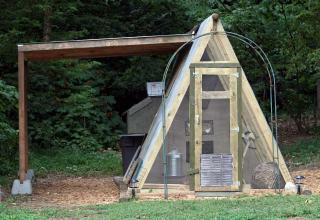 Total cost for the coop was around $500. Hardware cloth was around $150 of the total, but worth it. Shed addition cost $70. Things to add: A gutter on the front edge of the shed leading to a rain-barrel for water. A window would probably be nice, but it would have to be something like a small skylight because of the sloping sides. 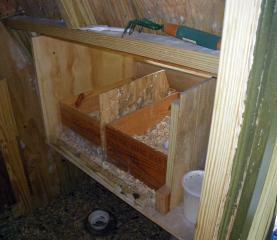 It would be good to have a cabinet under the nest box inside, but I ended up putting a small waterer and feeder there. A run on the back so the girls can forage a new area and allow the front run to recover a bit. 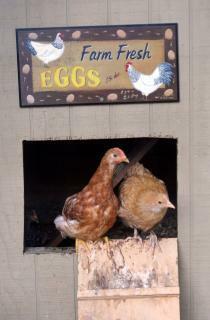 "A Town A Frame Coop The Peep Show"
Thanks for the great details included in creating your coop. I'm sure your girls are loving it! The pictures were great. This is exactly what I need! Thank you so much for sharing this! I love this! This is kind of what we have been looking at to build only better!